The colored pencils I use most. At left is a full-length Caran d'Ache Museum Aquarelle shown for comparison. There’s a concept for making decisions called “calling the dog.” I am unclear as to its origin, but apparently it’s a fable about two people who both claimed a dog as their own. They both called to it, and let the dog choose. Applied to real-life situations, the concept is that if you are trying to choose among a few things, and evaluating their attributes has caused confusion, you stop analyzing and just look at which one you tend to go to intuitively. In other words, you are the dog, and you “choose” the one that calls to you in some way. Recently, I was going through a mug in which I store “shorties” – the pencils that are getting too short to comfortably carry in my Tran Portfolio Pencil Case (when they get pushed down near the elastic, they’re difficult to pull out quickly). The photo above includes some multiples of colors I use especially often. I don’t waste the shorties, of course – I just retire them from my daily-carry bag and use them in the studio. 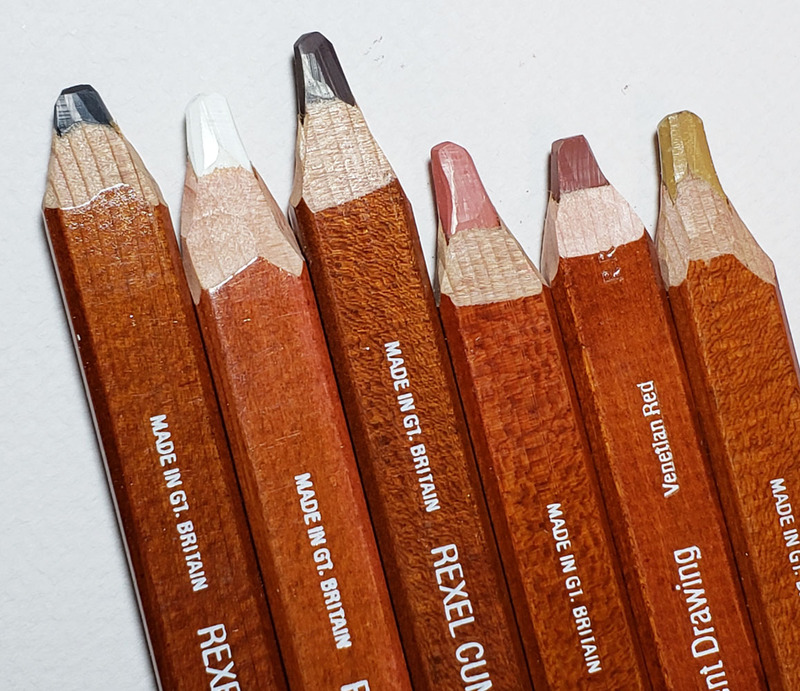 But looking at the pencils that I use most often made me realize that a color palette has been made for me by calling the dog. With duplicates and near-duplicates eliminated, the palette is shown below. The mid-tone green is an unessential convenience, but the other six are a strong palette of the hues I use most in an urban environment. 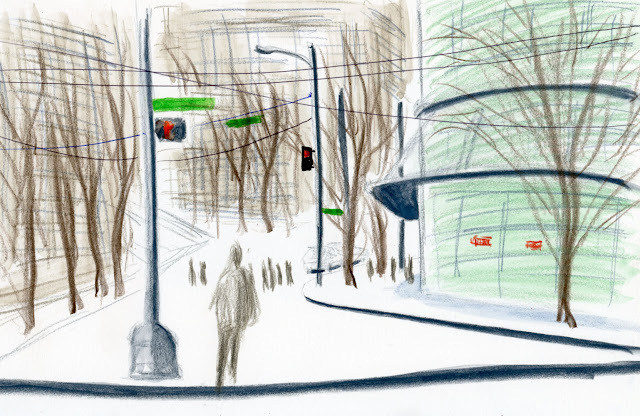 If I added sky blue (not often used in overcast Seattle, but essential on the occasions when I do need it), those seven pencils would probably cover 90 percent of my sketching needs. 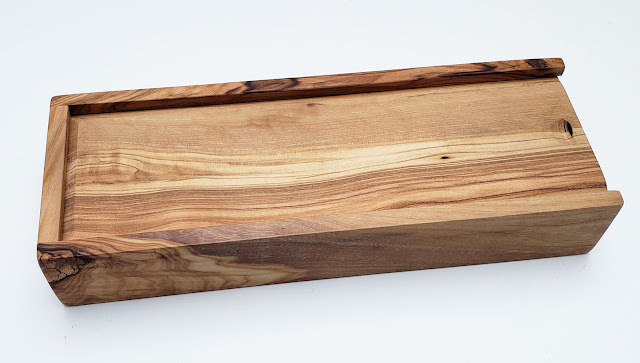 While I’d feel uneasy going out with nothing but a secondary triad or even a primary triad palette, I think I’d be perfectly confident with this dog-called palette for everyday use. 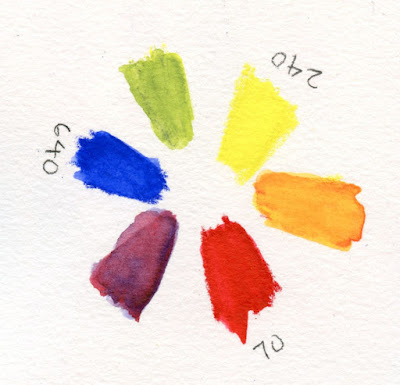 And with colored pencils, my dog palette makes more practical sense than a primary palette, which is based on paints that can be mixed much more quickly than pencil pigments. My palette called by the dog. 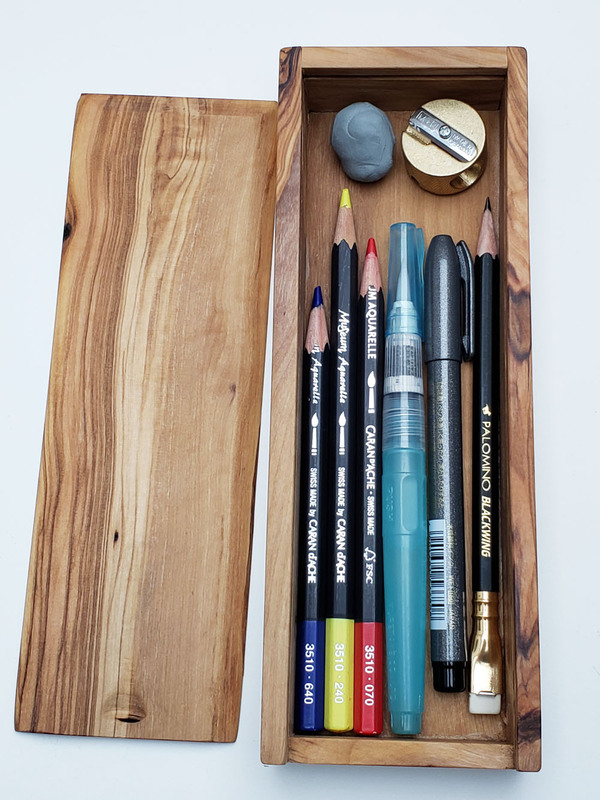 All this palette needs are the few other essential items from my idealized pencil box sketch kit – a graphite pencil, a brush pen, a waterbrush, an eraser and a sharpener – and the vast majority of my sketching needs would be met. I may be on to something. . . what do you think? 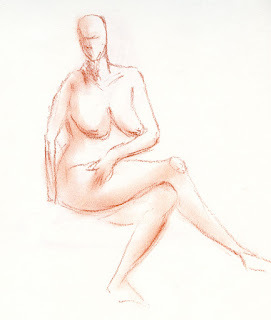 After the previous week’s missing mojo, I went to life drawing last Thursday wondering if I’d feel it this time. Although it wasn’t quite as bad as last time, I was still a bit sluggish. By the end of the session, I felt like my hand and arm were finally fully connected to my brain. I had maybe half a mojo. It always helps to have a strong, experienced model, and Randy is one of the best. A Gage Academy model for more than 15 years, he is certainly one of the most experienced models I’ve drawn. 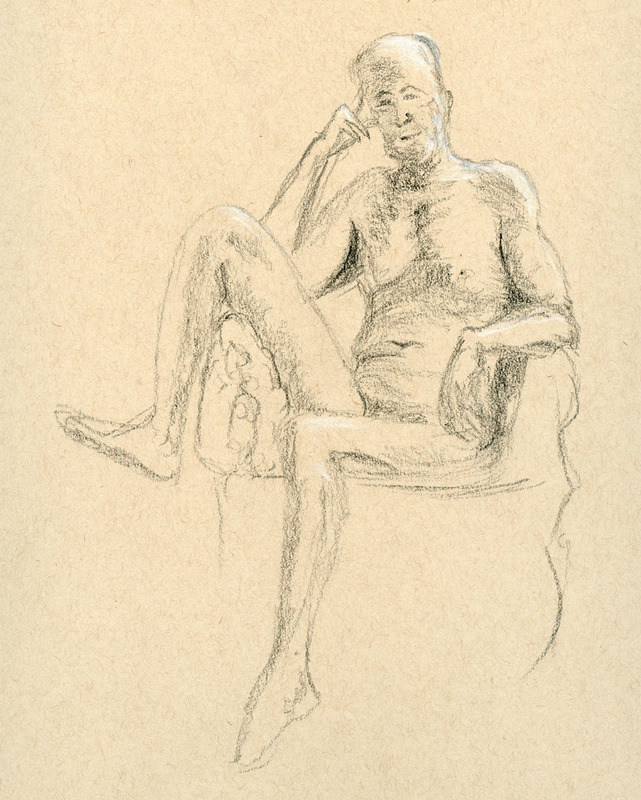 To honor his years of service to Gage (he’s possibly the most-often drawn, painted and sculpted person in Seattle! ), the school is going to host a “Randy show” next month. 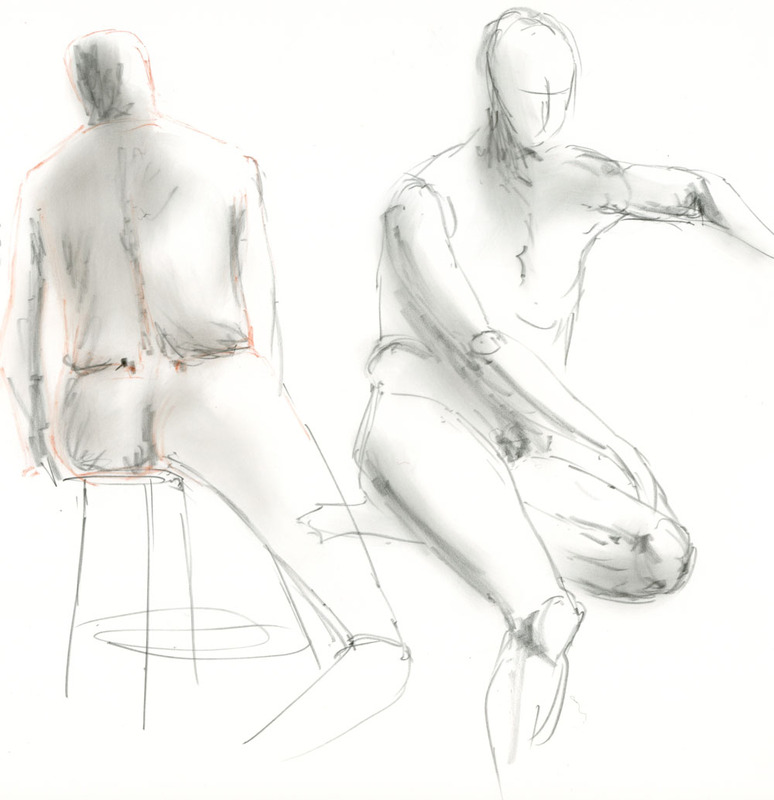 The entire exhibit will consist of works that he has posed for – even sketches from life drawing sessions – by instructors and students of the past 15 years. 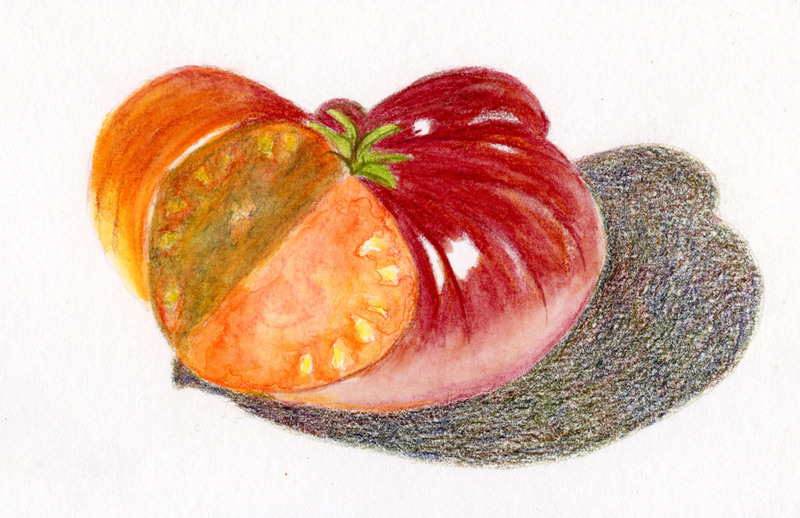 Shown here are two sketches of the same heirloom tomato, before and after Greg cut a wedge for his salad. In the first sketch (below), I was trying to take the painterly approach that I’ve been studying lately: using more water and fewer applications of pigment. 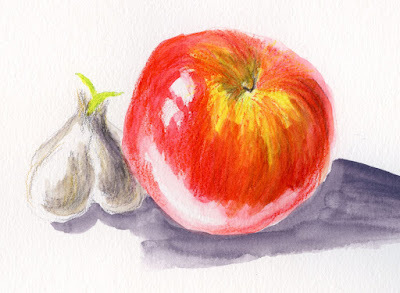 I don’t like the results at all – the colors are muddy, and it was extremely challenging to paint around all those reflections on the tomato’s lobes when I had a juicy brush that I was trying to move quickly so that the water wouldn’t pool. 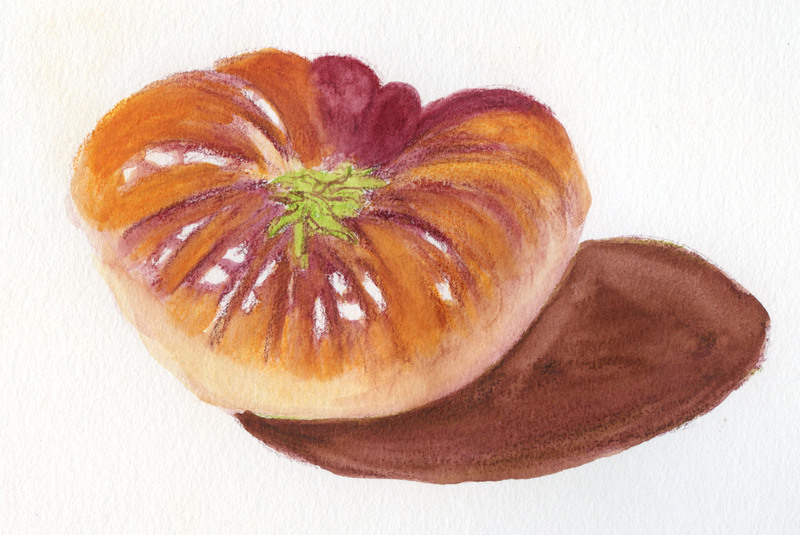 A couple of days later, I tried again (above), and the cut surfaces of the tomato presented all new challenges that I’d never encountered before (obviously I need to sketch incomplete tomatoes more often!). Getting the hue of the shaded side of the cut gave me the most difficulty. Although overworked from many cycles of dry-wet/dry-wet watercolor pencil applications to try to get the colors and textures right, I thought that taking the painterly approach worked well on these cut surfaces. 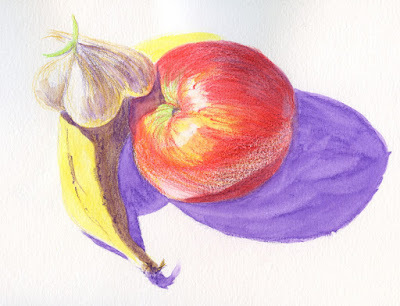 Blending colors wet-in-wet looks more convincing than trying to draw the organic color changes with dry pencils or with a more methodical approach. By the time I got to working on the smooth, uncut surface of the tomato, I had sort of forgotten about practicing more painterly techniques and fell back on the more methodical, multiple-application approach I had learned in class. It was much easier to keep the hues from muddying by using less water. 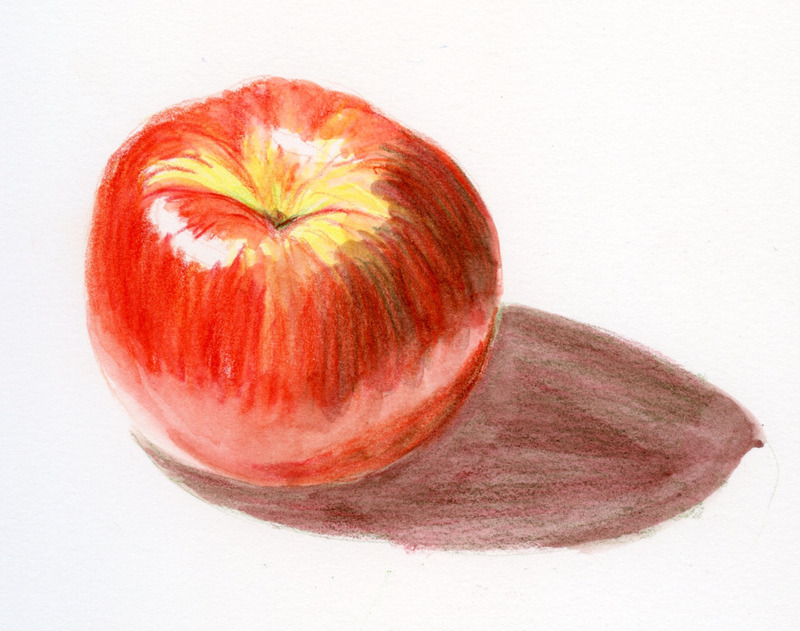 I’m finding I also don’t like the look of a large area of one flat color when activated with water (the tomato’s shadow, as in the sketch below) – the brush strokes show, no matter how carefully I work. So for the second sketch, I left the shadow unactivated. I prefer the interesting contrast between the smooth tomato and the textured shadow. One experiment that is working well is using traditional (non-water-soluble) colored pencils for certain lines that I want to retain sharply, such as the ones describing the “cleavages” between the tomato’s lobes. If I draw these with watercolor pencils, I lose them all when I apply water, and then I can’t see them anymore when I need them to guide the highlights. When I draw them with non-soluble pencils, I can still see them through the transparent activated color. Both sketches were done in a Stillman & Birn Beta sketchbook, and I gotta hand it to this paper: It takes everything like a champ. My overworking demanded many sequences of wet/dry, lifting color with a paper towel, and finally erasing back in a few secondary highlights that I lost during the overworking – with an electric eraser! The paper’s surface shows no signs of pilling or other damage. Thinking about a sketch kit so small that it would fit in my pencil box has gotten me interested in (OK, obsessed with) the whole sketchbook/paper question again. 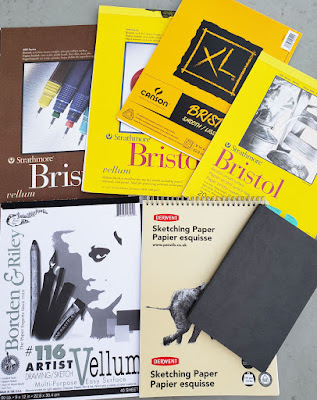 My love for graphite, awakened by the workshop I took with Eduardo Bajzek in Porto last summer, prompted me to rethink my everyday-carry sketchbook paper. Up to that time, I had been perfectly happy with Canson XL 140-pound watercolor paper with all media that I typically use – but with graphite, it’s just too toothy to use in the softly toned manner that I enjoy so much. meet all my media needs. Is there really no paper that would meet all my needs if I’m willing to make some compromises? After all, even my everyday-carry Canson XL watercolor paper is a compromise: With all other things being equal, I prefer Stillman & Birn Beta’s weight and texture for wet media. And Canson XL has the annoying “feature” of being slightly less toothy on one side than the other (not surprising for student grade). But for the price and convenience of the pad size (9-by-12 inches, which folds into an ideal 6-by-9 inch signature size), I’ve decided those are reasonable tradeoffs. If I were to fully reopen my mind, would a single paper option exist . . . .? After mentally reviewing all the sketchbooks and papers I have tried, I landed on one possibility for meeting all my media needs: Stillman & Birn Zeta. The heavier version of Epsilon, Zeta has a hot press surface that is not quite as smooth as Bristol but is adequately smooth for the graphite techniques I use. In fact, Epsilon was one of my favorites with graphite among the contenders last fall, but I rejected it because its 100-pound weight couldn’t hold up to the spritzing I often like to do with watercolor pencils. I must have forgotten about Zeta then, even though I’ve had a book on my desk for a couple of years and use it occasionally with markers, ink or colored pencils. With the same 180-pound weight as Beta, Zeta can certainly take even a heavy wash and spritzing. The proverbial light bulb blinked on! Headed downtown for an errand last week, I grabbed the Zeta sketchbook. 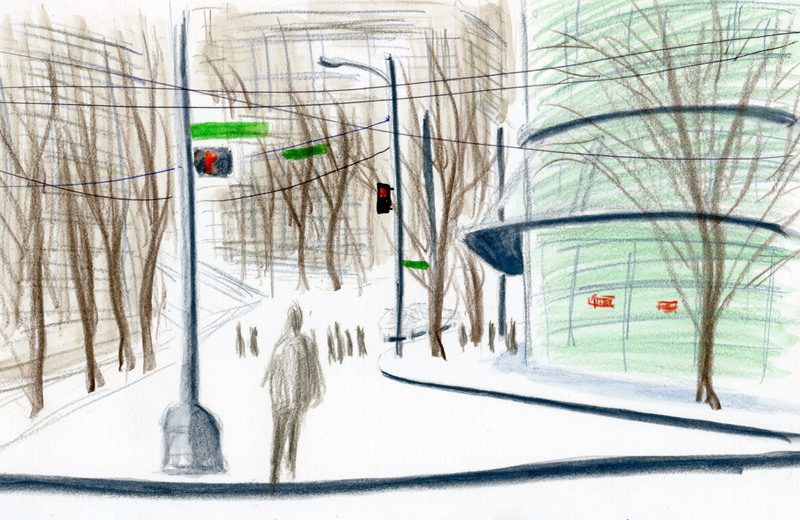 From a Starbucks window seat, I made the sketch above. I didn’t apply large areas of watercolor pencil, so it wasn’t the best test of Zeta’s water tolerance, but I thought the activated areas were satisfactory. Later at home, I gave Zeta a more rigorous workout – and put it head-to-head with Canson XL. (Caran d’Ache Museum Aquarelles were used in all tests.) 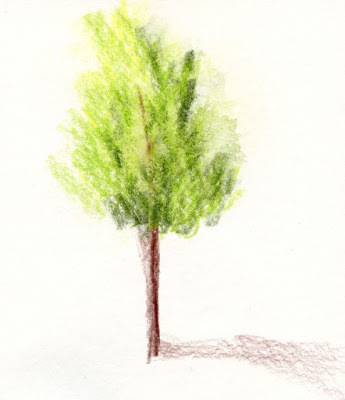 Since I tend to use my spritzing technique with foliage, I sketched a couple of quick trees from imagination and spritzed them. Although the two papers tolerated sprayed water equally well, I really miss the texture that the Canson XL imparts – the spritzed foliage on it just has a leafier look. Next I sketched an apple on both Zeta and Canson XL (also shown here for comparison is a still life I made a few weeks ago on Stillman & Birn Beta). Although I usually take more time with still lives, for these tests I deliberately emulated a more on-location approach by slamming down the pencils fairly hard and fast (methods not recommended by traditional colored pencil artists). I also used more water than I typically might in a careful, more methodical approach. Again, both Zeta and Canson XL held up to water equally well. Zeta’s sizing, however, is different, and the pigments don’t look quite as rich when activated as they do on Beta or my daily-carry Canson. Maybe it’s just the difference that painters experience between hot press and cold press papers, but the colors seem a little flatter on the untextured surface. What do you think? The results of my Zeta testing come down to two qualities: texture (or lack thereof) and color intensity. Are they reasonable compromises if the benefit is being able to carry one type of paper for all my media needs? Or are they deal breakers? There’s only one way to find out. I have a little more than half the pages remaining in the Zeta sketchbook. I’m going to use it exclusively on location until it’s full. By then, I should have the answer to those questions. Shortly after I began sketching in 2011, I decided to give myself the challenge of drawing one hundred self-portraits. Describing that experience was one of the first blog posts I published. 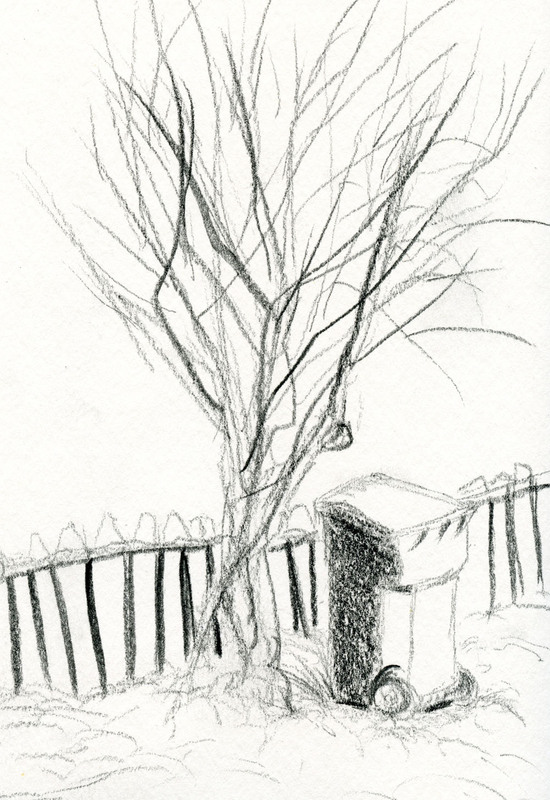 I’ve done a few more here and there since that project, especially in winter when sketching subjects must be indoors. Apparently there’s a Facebook group called Selfie Sunday (though I haven’t joined), whose members post selfies every Sunday. Then Roy DeLeon decided to simplify the challenge by inviting a few online friends to make selfies whenever and share them with the hashtag #sundayselfiesketches. I don’t know how often I’ll participate, but I admit that when I can’t find anything else better to draw, it’s easy to simply look in the mirror. And if you’re ever feeling cocky for any reason, nothing is quite so immediately and thoroughly humbling as making a self-portrait. I probably say this every year, but it’s difficult to sketch while your toes are tapping to bluegrass! 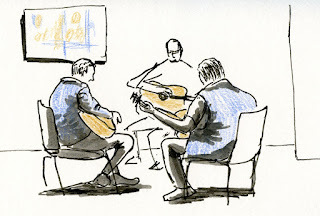 For the sixth year, USk Seattle sketched at Wintergrass, the Seattle area’s annual bluegrass music festival at the Bellevue Hyatt Regency. 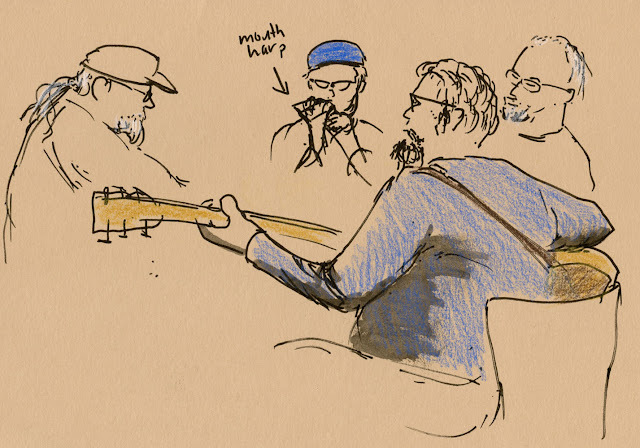 It’s an annual favorite for good reason: Lively music is fun to sketch by, and all the jammers seem to be enjoying themselves. Their enthusiasm is contagious. Friday morning seemed quieter than usual this year, and jammers hadn’t gathered yet. 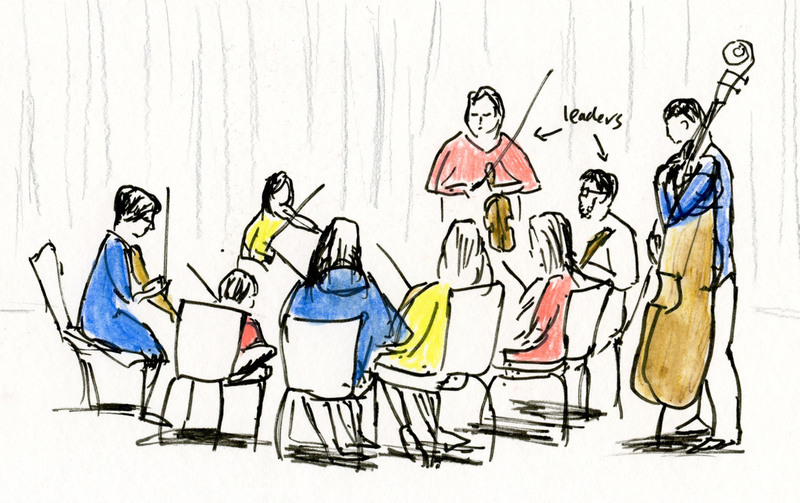 Hearing music from an auditorium, I slipped in to see what was going on (sketch at top of post). (Ticketed events are ongoing throughout the festival, but we never attend the scheduled events because so much free, spontaneous music is happening in the hotel’s public areas.) Several musical youth groups were rehearsing for later performances, all at the same time, so the music was . . . cacophonous. Still, it was fun to see fiddles and other instruments of all sizes to fit their owners. 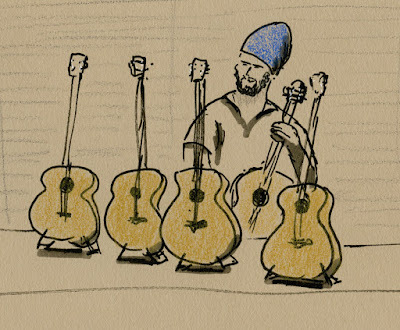 I found a man selling guitars (he had a lot more for sale than I show in my sketch) in the vendor area. Some vendors had beautiful handcrafted mandolins, violins and banjos that were works of art themselves. By the time I finished those sketches, jammers were starting to form small groups wherever they could fit a few chairs together. 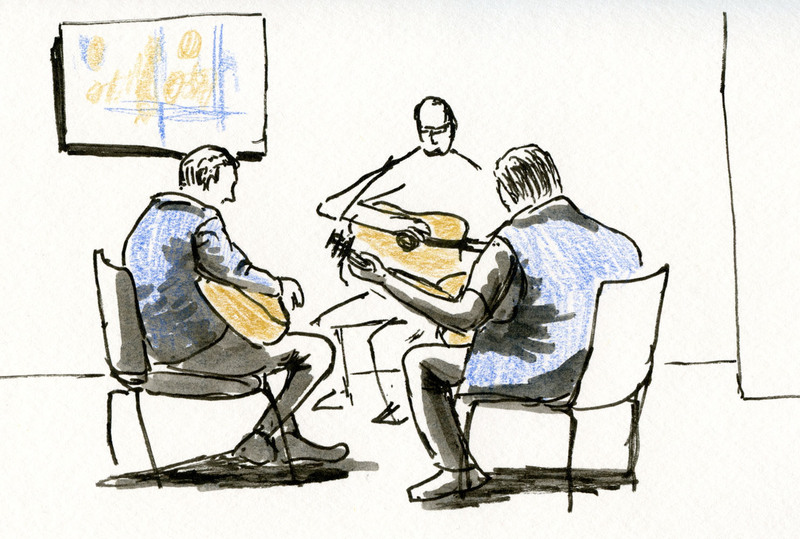 This is what I come to Wintergrass for: to sketch and listen to people making music spontaneously. It’s like the musical version of urban sketching! I wish I'd asked what this instrument was called. . .
maybe a type of steel guitar? Last year during InkTober, I discovered the joys of sketching with a ballpoint pen and learned to appreciate the nuances of the ubiquitous Bic. 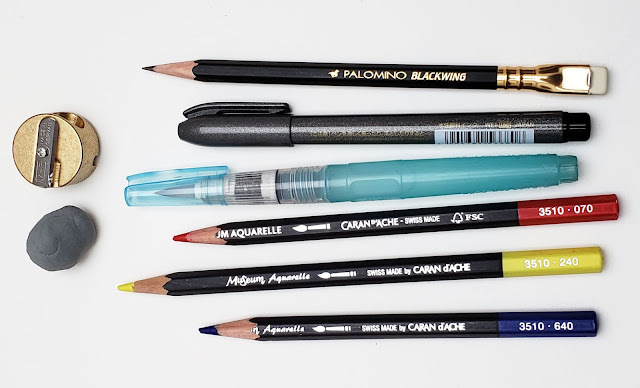 Its distinct formula of ink is somehow different from many ballpoint inks that may write more smoothly or consistently but lack pressure sensitivity and the ability to build in value in a way that is very similar to graphite. As much as I enjoy using the ink in classic Bic Cristal and Stic pens (which I generally acquire free from hotel rooms), their cheesy, capped bodies leave a lot to be desired. Shortly after InkTober, I went through our junk drawers to see if any other ballpoints had a similar ink, and I was pleased to dig up a Zebra F-301 that fit the bill. It got bonus points for being retractable and refillable. At $2 a pop, the price is hardly more than a free Bic. Of course, Bic has another form factor that I had completely forgotten about: the retractable Bic Clic. Amazingly, I already own several, all of which were gifts from Field Notes, my favorite pocket notebook company, when I’ve ordered directly from its site. Since I’ve only been paying attention to ballpoints since last InkTober, I had been dismissing these free pens as throwaways (although, thankfully, I hadn’t thrown them away). During a Valentine promotion when Field Notes Brand was giving out a red pen, I looked more carefully at the black ones I already owned – and that’s when I realized they were Bics! I prefer the simple, retractable, tapered body to the Zebra and all the capped Cristals and Stics I had used previously – and they cost the same as my hotel room Bics. I felt a bit chagrined that I had looked down my nose at these previous gifts that have suddenly become useful to me. 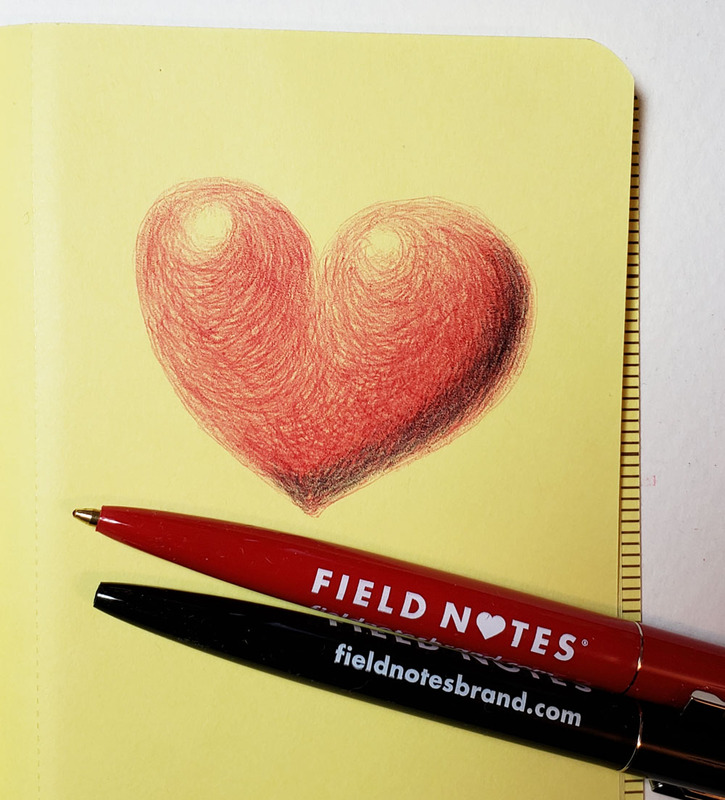 But now I’m showing my love for the Field Notes Bic by making it a permanent part of my sketch kit. Once again, Field Notes has something I need – if I just pay attention. Technical note: This little sketch was a first for me – an attempt to render something three-dimensionally and realistically from imagination. It was remarkably difficult for such a simple image. 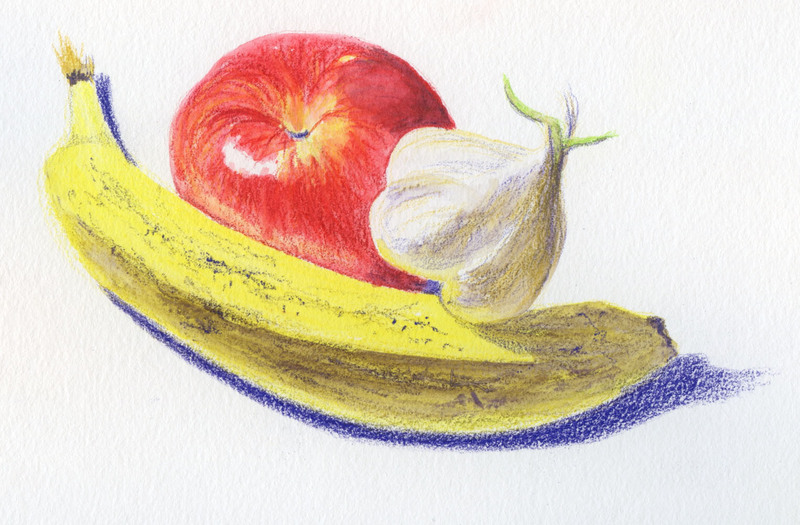 I tried to apply the principles of “light logic” that I learned in my studies with Suzanne Brooker, which I practice every time I make simple still lives of fruit on my desk. But it’s very different without fruit to look at. The core shadow and highlights were easy enough to place, but without an actual three-dimensional heart in front of me, I wasn’t as confident about subtler contour shading. After a while, I turned my garlic (the same sprouting one you’ve seen numerous times) upside-down, and two adjacent cloves helped me imagine the heart’s lobes. Finally, I checked my work, as it were, by searching for Internet images of three-dimensional hearts. Whew. Who knew this little heart I wanted to draw to express appreciation to Field Notes would be so difficult. I have immense respect for and awe of illustrators, cartoonists and other artists who render things realistically completely out of their heads. Once in a while I’ll see sketches shared on social media that are done on unconventional supports. 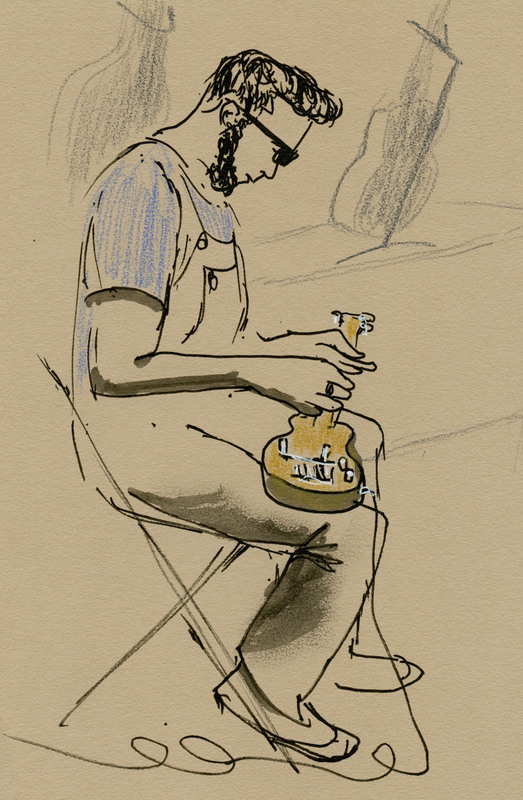 Australian urban sketcher Peter Rush is well known for his sketches made on cardboard packaging (like cereal and cracker boxes). And other sketchers are even more spontaneous, using things like maps and brochures when they travel. I thoroughly enjoy the look of these drawings, especially travel sketches done on related ephemera. In fact, every time I travel, I have the intention in the back of my mind to do one or two sketches on a brochure about something I’ve experienced in that country, but somehow I always forget when I’m there. As I’ve learned during my annual sketch kit diets, the tools I choose integrally depend on the sketchbook paper I choose. It turns into a complicated business: If I choose toned paper, then I need a white pencil and a tonal marker or two. If I choose a toothy watercolor paper, then I won’t enjoy using graphite on it. If I decide on thin, smooth Bristol, then I might as well forget about water-soluble pencils. Yesterday you saw my pencil box from Portugal filled with my most beloved, most essential sketch supplies: four pencils (one graphite, three colored), one brush pen, one waterbrush, an eraser and a sharpener. Those items were chosen without regard to paper because I decided to see how basic I could be – a sketch kit that could work on any paper. Today I’m showing the results of my experiments sketching only on paper I found in my recycle bin. The apple sketch (top of post) was made on the inside of a light cardboard box that contained greeting cards for inkjet printing. It was the heaviest piece of paper in my bin, so I thought it would be the best bet for using a little water. 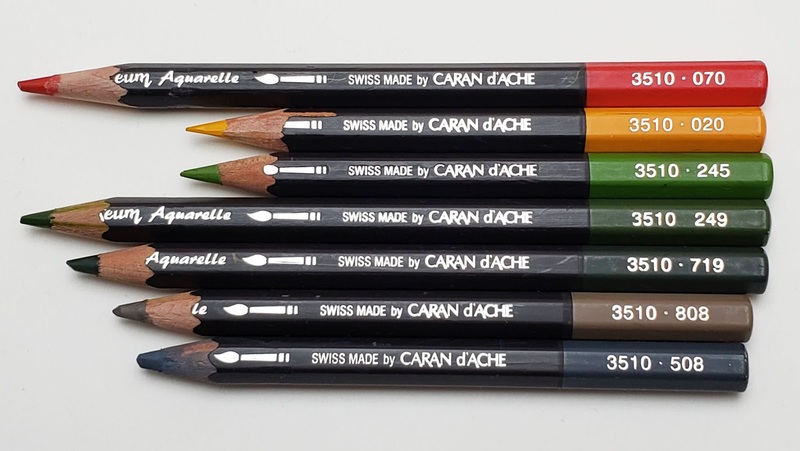 The activated pigments in the Caran d’Ache Museum Aquarelle colored pencils sunk quickly into the cardboard’s unsized surface, so the hues aren’t as vibrant as they would be on watercolor paper. Otherwise, however, the smooth surface wasn’t unpleasant to apply pencil to, and the paper certainly didn’t buckle (and if I had only thinner paper, I could simply use colored pencils without water). 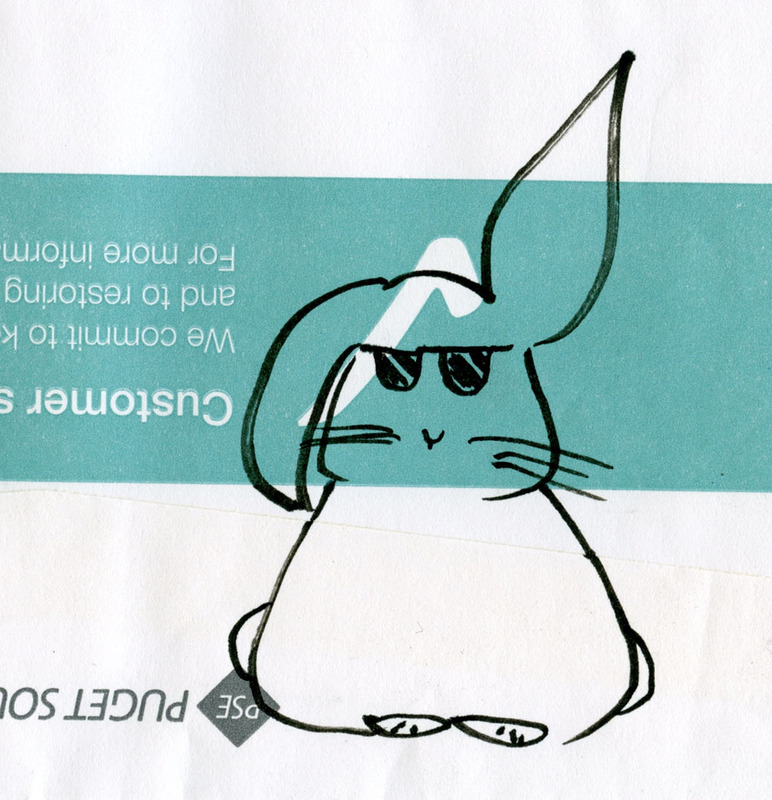 Next, I used the envelope a utility bill came in with the Zebra brush pen to draw Weather Bunny. Sometimes I like making simple line drawings with a marker, and the Zebra works well on almost any paper without bleeding, so I knew it would be fine. 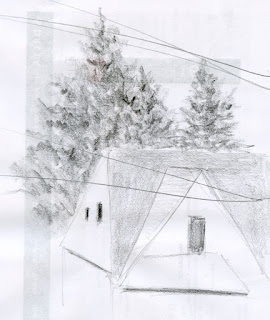 Finally, I wanted to do a simple graphite sketch of the view from my studio roof window. Graphite pencil, of course, works on almost anything. 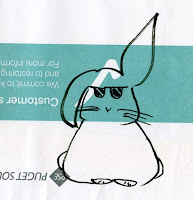 I used the back of a discarded sheet of ordinary inkjet printer paper. How about that primary palette I chose? A big lesson I learned from last month’s minimalism challenge was that a secondary palette, though fresh and exciting, can be too limited. While predictable, a more basic primary palette is more versatile. 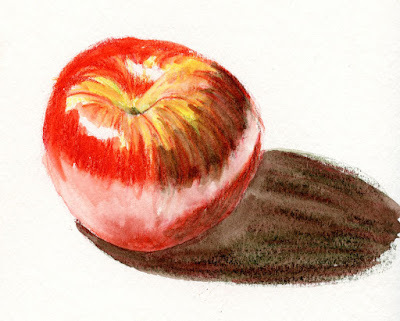 It’s ideal for a honey crisp apple, and it’s probably also sufficient for urban sketching. That’s as yet untested, though; maybe when the trees start to leaf in a few months and it warms up, I’ll take this minimal kit, including this primary palette, outdoors for more experiments. 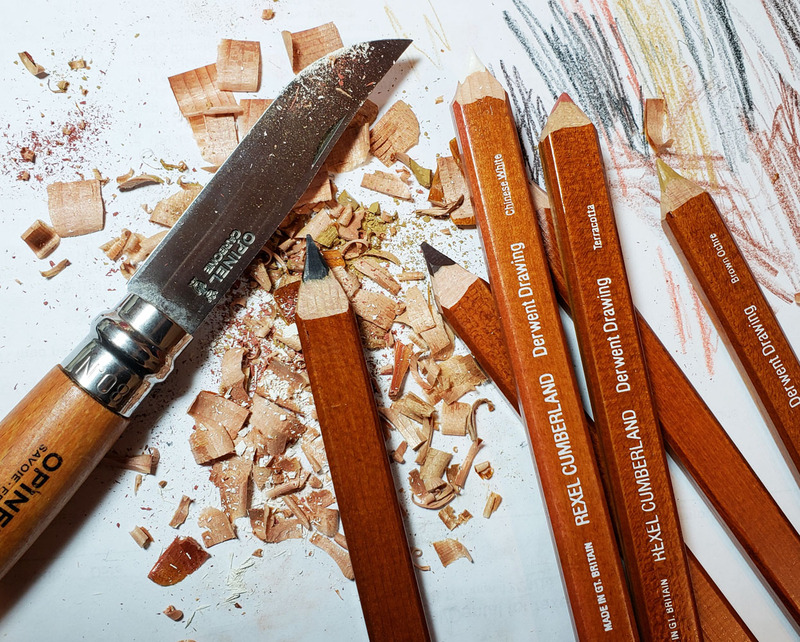 Imagine the freedom of traveling with only these eight implements and paper gathered along the way. . . .
Can you imagine traveling with a sketch kit this simple. . . ? The pencil box I bought in Lisbon. When I was a little girl, I had a small, transparent plastic box that I filled with the kinds of things little girls like to collect: polished rocks, shells, a penny with my birth year, a foreign coin from someone’s exotic holiday, a blue eraser shaped like an elephant (with glued-on googly eyes). It was that wondrous, simple time of life when all of one’s most valued possessions would fit in a small plastic box. Now that I’m at the age when I not only don’t need any new possessions but I’m also working hard to get rid of the ones I own, I look back on that time wistfully. Of course, you know how much I love my art materials and having lots and lots of choices; I’m not ready to give up all of that. But you also know how often I think about which sketch supplies I would (hypothetically) take to Gilligan’s Island. And you know how I enjoy challenging myself each winter by paring down my sketch kit to the bare minimum. Despite how much joy my art materials spark, some part of me still has the desire to fit all my most valued possessions in a small box. When I was in Portugal last summer, I bought a wooden, slide-top pencil box from a stationery shop in Lisbon. It’s been empty since I brought it home because I couldn’t decide what to put in it. 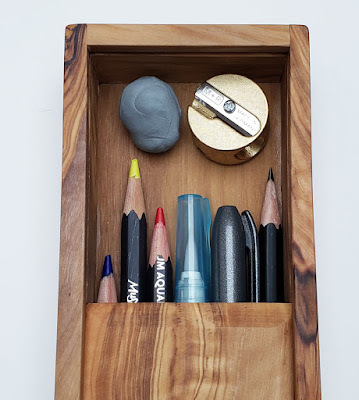 I don’t have a collection or set of anything small enough to fit, and I didn’t like the idea of simply filling it with a bunch of random pencils or pens, so I left it empty, thinking that I would eventually find the right thing. On a recent rainy morning, just after we had given to charity another load of stuff from our house, I started looking around my studio with the perpetual question: What is the absolute smallest sketch kit I could have and still be happy? A kit so small that it would fit in the box from Portugal? 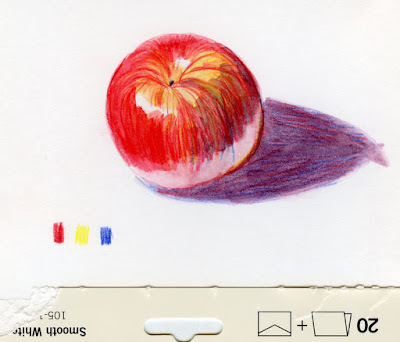 Shown here is that morning’s answer: One Blackwing pencil, one Zebra waterproof brush pen, a Kuretake waterbrush, three Caran d’Ache Museum Aquarelle pencils (primary colors), an M+R pencil sharpener, and a kneadable eraser. As you might guess, each item was very carefully considered, but since I had only recently ended my month-long minimalism challenge, the lessons learned were still fresh in my mind, so it didn’t take long. The biggest difference compared to that challenge was that I chose a primary palette instead of secondary (which is visually exciting but more limiting). The art supplies I value most. I’m sure I could have jammed a few more items into the box, but as an act of discipline, I allowed myself only a single layer of implements. Everything is visible and fully accessible without removing anything else first. This small pencil box of my most essential tools sparks endless joy. I’m keeping it on my desk as a visual reminder that it doesn’t take much to keep me artistically happy. But wait – what about a sketchbook? The fact is, the world (and certainly my house) is full of paper of all kinds without ever opening a sketchbook. In tomorrow’s post, I’ll show you the results of my sketchbookless experiments and also show my primary palette at work. In my efforts to practice a more painterly approach to using watercolor pencils, I’ve learned a few things that weren’t as apparent to me when I took a more pencil-ly approach (for lack of a better term). For one thing, to take a painterly approach, it’s vital that the pencils contain a generous amount of pigment. 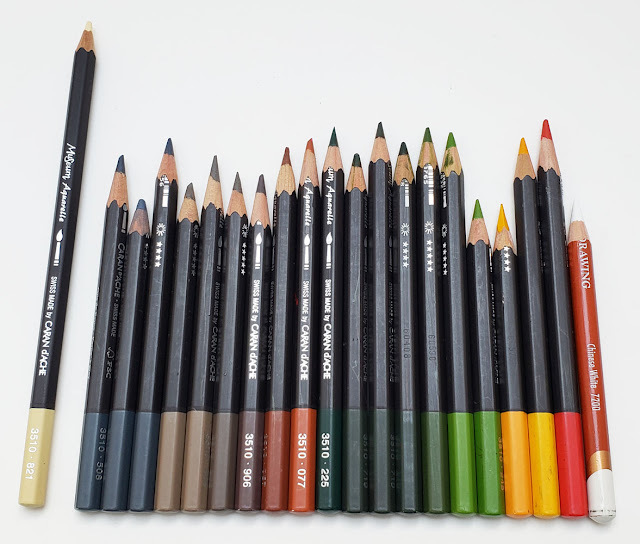 When using them dry or in a series of dry-wet/dry-wet applications (the method I learned in Suzanne’s class), pencils can contain a mediocre level of pigment and still produce acceptable results because more layers can be applied. But after applying a wetter brush load of water, it’s more difficult to continue applying many more layers of dry pigment, so the initial application had better be fairly heavy. This approach suits me fine, as it’s what I’m used to when out in the field: I like to apply as much pigment as possible in one shot and activate only once. Another thing I’m learning is to blend and mix colors in a more painterly way. 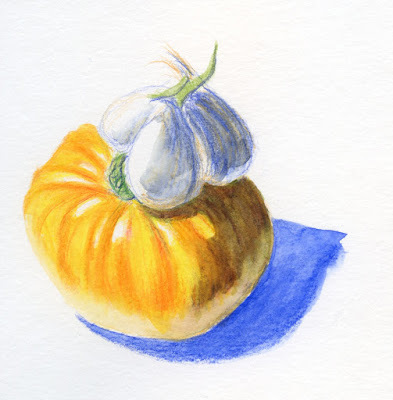 In the sketch below of a tomato and garlic, I had chosen complementary blue for the shadow cast by the garlic on the tomato, which seemed mostly orange when I colored it. When I activated the blue, though, I saw that the shadow had turned out too green because the tomato contained more yellow than I realized. It also wasn’t dark enough. I made a few test swatches, and I saw that applying more blue over that yellow/orange/blue combo would not improve the shadow color. 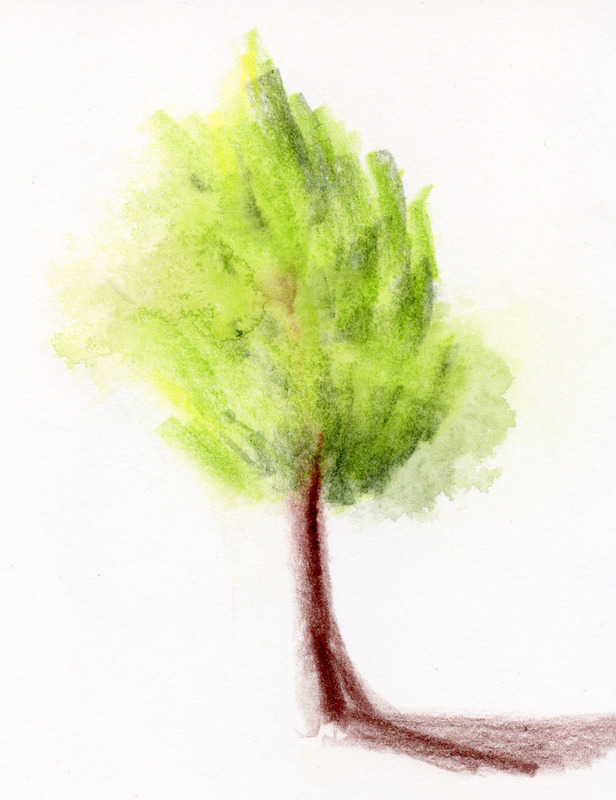 Trying to think like a painter in this situation, I considered adding red to the mix – the complement of green. 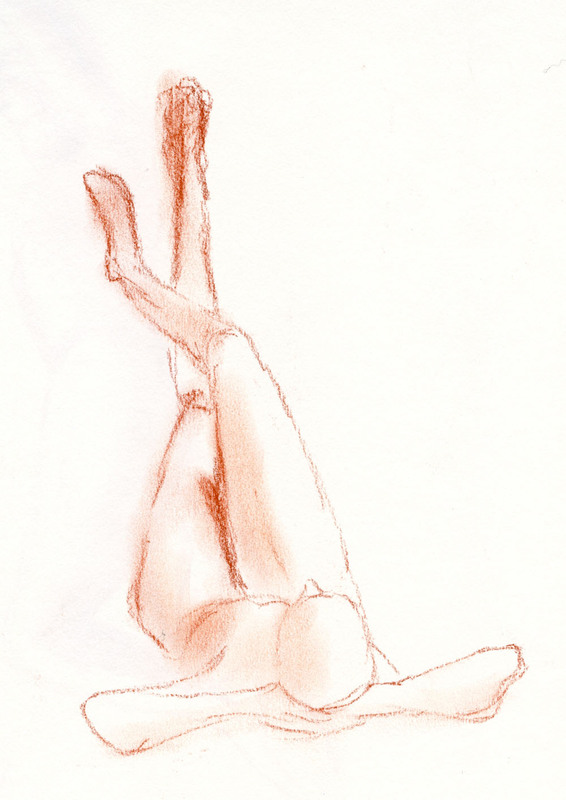 Red pencil applied dry looked strange, but when activated, the resulting brown, though muddier than I prefer, was an acceptable shadow in that it was the right value. I don’t know how painterly the result looks, but since I had to think like a painter to achieve it, I still consider it a painterly approach. 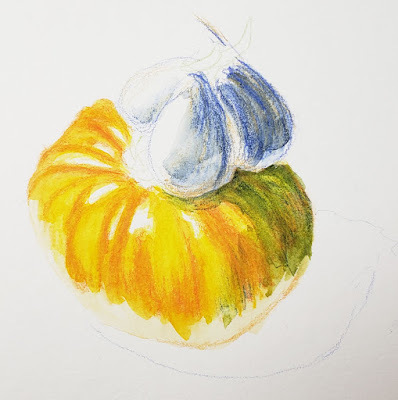 In progress -- I didn't like the green shadow cast by the garlic onto the tomato. A few weeks ago I sketched an avocado and a satsuma to get some practice with rough and matte surfaces. (Shiny, smooth surfaces are easier because their gleaming highlights do much of the work of evoking the forms.) Looking for more practice, I found a potato and a sumo orange in our kitchen. The orange’s strange, bumpy texture and equally strange shape were a fun challenge. 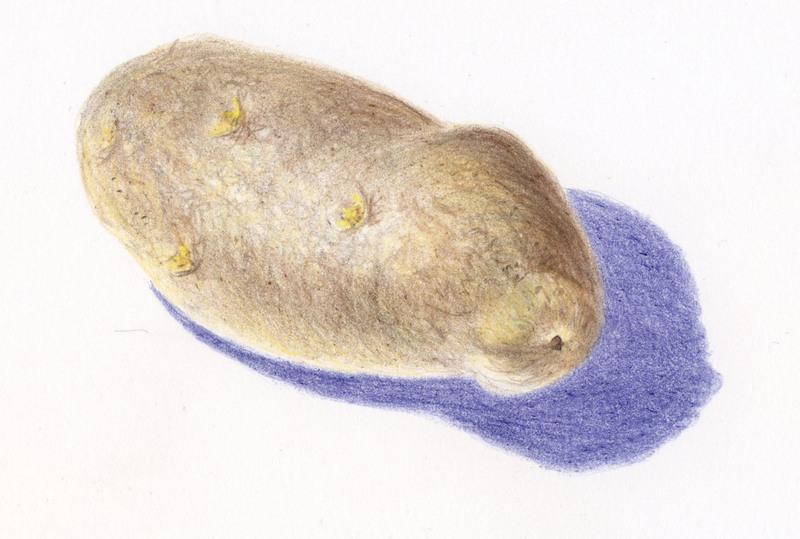 The potato turned out to be more difficult than I expected. 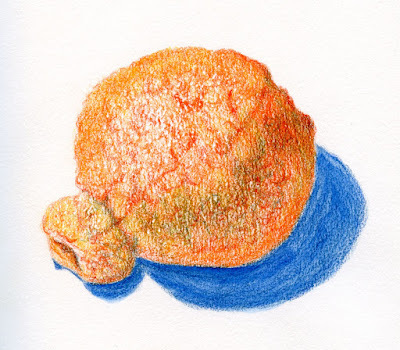 As I tried to depict its shape, which is less textured than the sumo orange but irregular, I was reminded of the landscape-drawing classes I took from Suzanne Brooker. We frequently worked on the challenges of conveying gently sloping hillsides and bumpy terrain. Technical note: The potato was challenging in another way: I hadn’t used Derwent Lightfast colored pencils in a while, so I pulled out my smallish collection, which I knew had mostly earthy tones that would work well on the potato. Quite possibly the softest, waxiest pencils I own, they were at first easy and very smooth to apply. With subsequent applications, however, they were so waxy that they started feeling like they were sliding off the previous layers – like walking on ice (doing that in the days following snowpocalypse is still fresh in my memory). Harder pencils don’t have that effect. The more I use very soft colored pencils, which I favored at one time, the more I prefer harder ones like Faber-Castell Polychromos. 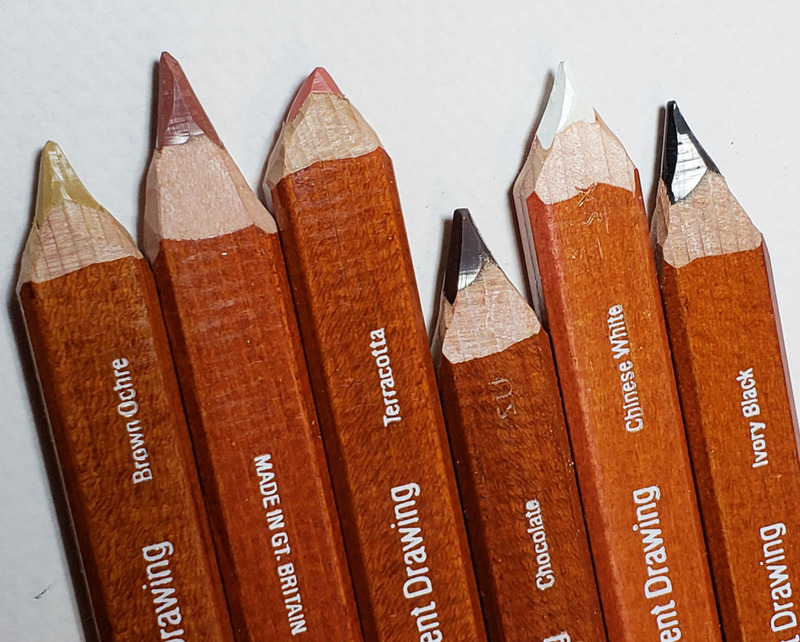 Choosing among colored pencils with hard or soft cores is a difficult question, and the choice depends on preferred ways of working. My shift in preference from soft to hard points out a difficulty in choosing materials when one is relatively inexperienced with working in a particular medium. I think this happens frequently with other media, too: You just don’t know what you’re going to like until you’ve used it a while. That’s why it’s so difficult to make recommendations when asked about materials: I think it’s always best to try a variety of options instead of simply duplicating someone else’s choices. 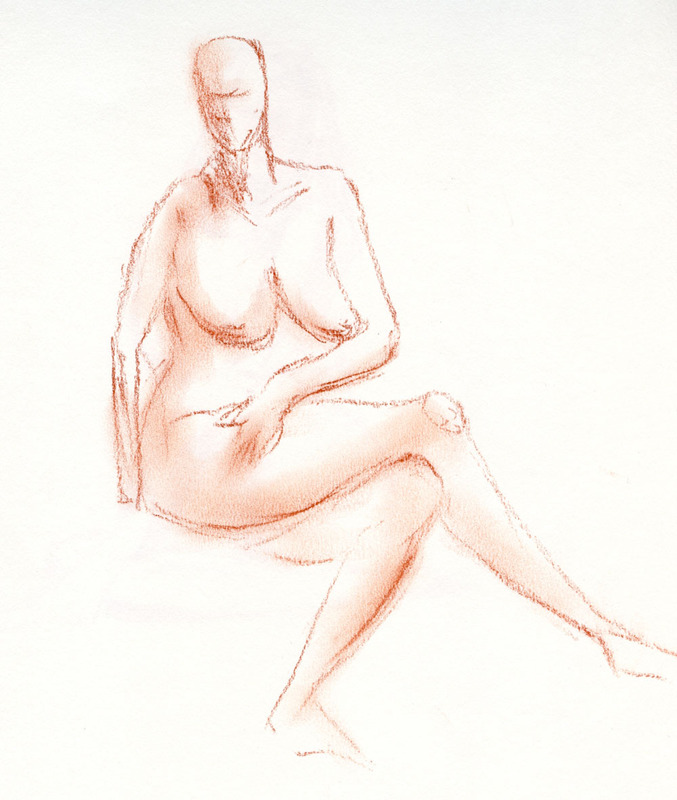 I wasn’t feeling it last Thursday at life drawing. It wasn’t the model’s fault – Shannon is always excellent, and I’ve happily drawn her many times, including last fall when working on a long pose of her put me fully in the zone. I don’t expect to get in the zone every time, but I was hoping to feel some of the mojo I had the last time I was at Gage. I kept switching media and paper, hoping to find the right combo that would put me there again, but nothing quite did it. 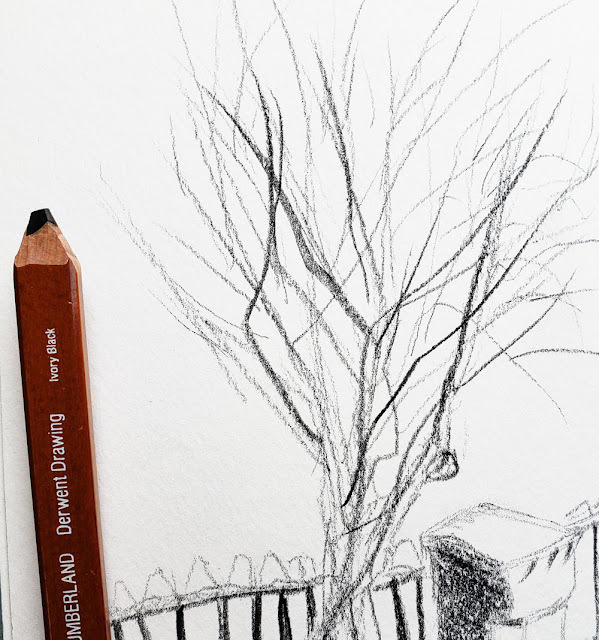 Because I sketch so regularly and share often on social media, friends have called me a “sketching machine.” It’s a compliment, and I certainly accept it as one. But one of the most frustrating things about drawing is that the ease (and I use the term “ease” relatively – it’s never easy) with which it comes varies constantly. It might not even be apparent in the results, but it’s the way I feel when I’m making the sketches. Even with regular practice, some days are better than others. If I were a true machine, I could draw with the same degree of flow and confidence every time. its two ends sharpened with different points. When I reviewed some vintage Rexel Cumberland Derwent Drawing Pencils, I wrote about how much I enjoy using them at life drawing sessions, especially the flat carpenter pencil-shaped ones. The soft, thick, colored cores are the same as those found in their round contemporary counterparts, but the rectangular cores in the carpenter pencils can be cut in different ways to provide a variety of line widths and marks. I’ve only just begun experimenting, and I’m still learning how to whittle the points at different angles. A few days ago, a YouTube video about carpenter’s pencils was brought to my attention. Intended for actual carpenters, not sketchers, the video explains why carpenter’s pencils are flat, how their standard dimensions are useful in carpentry, and other fascinating information. Watching it being sharpened was especially informative to a novice knife sharpener like me. Carpenter's pencils sharpened Darth Maul style! 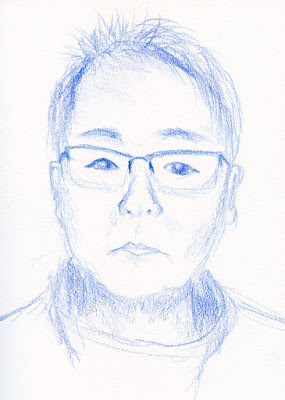 A couple of year ago I discovered a Uni Mitsubishi graphite pencil with a 10B core called a fude enpitsu (“brush pencil”). Sharpened to a chisel point, it can make a wide range of line widths, just like the fude fountain pen nibs that have been my favorite for years. 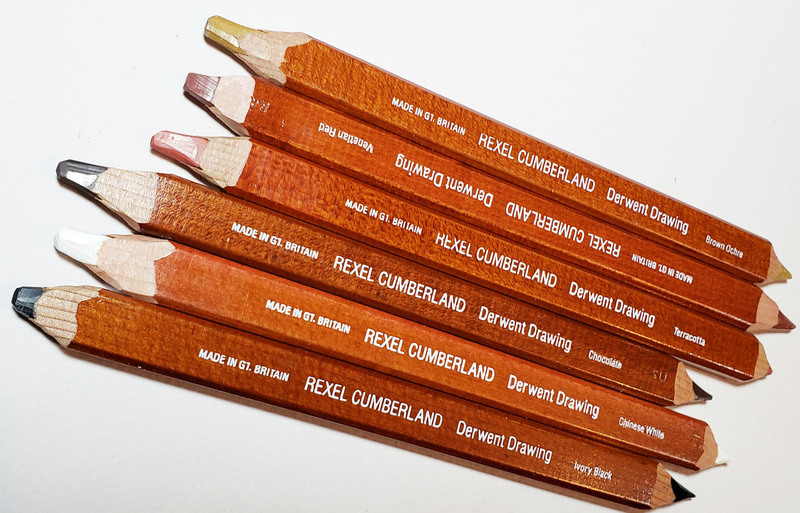 But now that I’ve been using these carpenter-style drawing pencils, I’d have to say that the vintage Derwents are the true fude of pencils. Pointy on one end. . .
. . . blunt on the other. I had so much fun that I gave myself a blister. Here's the chisel point on one end of the pencil I used for this sketch.